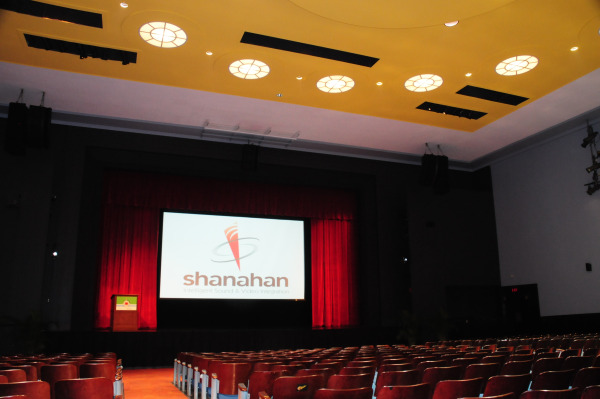 Shanahan recently completed a successful ground-up refurbishment of Northeastern’s famed Blackman Auditorium. As the home to such varied events as a recent talk by Maya Angelou, a performance of Chinese acrobats, musicals, as well as academic lectures, the sound and visual needs to be of the absolute highest quality. Because the space so frequently operates as a classroom, the controls needed to be professor-friendly, which meant that it is not only easy to use, but that the system would seamlessly integrate with the professor’s audio and video presentation. How many minutes have we all wasted while a presenter fiddles with his or her laptop to get a presentation going? Shanahan provided the Northeastern University technical department in-depth training for its sound system. But, professors can learn the system in 90 seconds: A single rotary switch operates the main systems in the auditorium – one setting allows for all of the extensive needs of a top quality performance and the other, the simple setting, lets Professors walk into the room and operate everything with a single push of a button. Putting a sound and video system into a new auditorium is one thing, but retrofitting one for a cavernous former Catholic church is another. 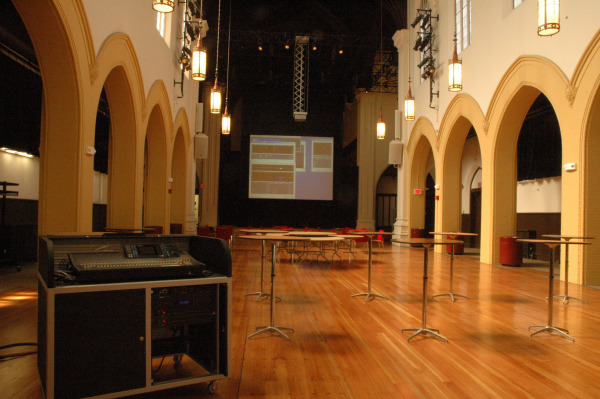 Shanahan Sound employed all the latest in audio and video technology to ensure that wherever you sit at Northeastern University’s Fenway Center (formerly a Catholic Church) you will have the optimal sight and sound experience. Shanahan faced head-on the problem of a lot of dead space, to ensure that those spaces came to life, as well as creating a 60 x 40 foot custom lighting grid for the entire stage area. Above and beyond all that, when someone wants to control the audio and video, he or she can do so with the touch of a button. The Fenway Center hosts dance teams, choral groups, lectures, orchestral ensembles, and community church services. "With [Shanahan's] assistance, our venues have transformed into state of the art performance centers. Shanahan consistently delivers with top level service"